Nothing is too much when it comes to the creativity of designers or artists from all over the world. In a digital age, they come up with all sort of unconventional design ideas such as recycling old vinyl records and ingeniously transforms them into awesome objects with original and appealing designs which are great for the home. If you are excited about this idea and want some unusual products, see below 22 cool ideas. 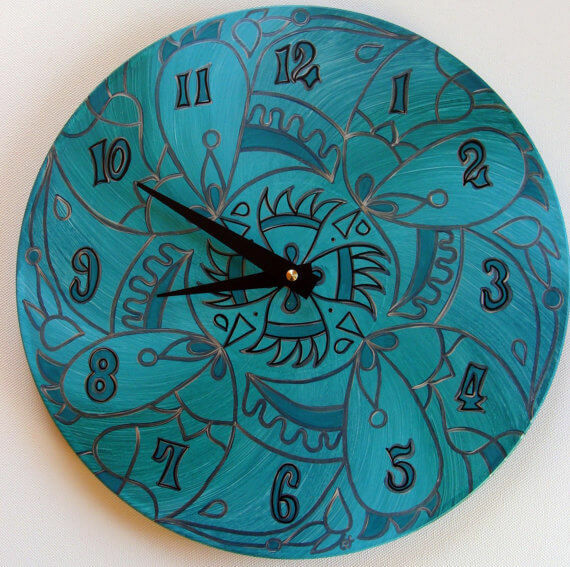 Christine Claringbold recycles vinyl records and transform them into beautiful clocks, bowls, mirrors, cuffs, and garden pinwheels. She has a collection of vinyl objects gorgeously hand painted with acrylic paints. Paul Cocksedge find a creative way to enhance today’s digital music by creating these elegant vinyl “speaker”s. They are made by transforming old vinyl records through heating and moulding. They amplify sound without the need of electricity. “Change the record” was released at the London Design Festival 2011. Photos: © Paul Cocksedge. Estonian designer Pavel Sidorenko create functional and playful products that retains its simplicity, interacting with the space and user. His wall clocks carved in vinyl are ticking on a piano, a chair, a gun or framed by architectural and cultural landmarks of the various European capitals. Hazel from UK uses only scratched records and her interesting objects are handmade through heating forming. Portuguese designer Luis Teixeira creates lighting made of all sort of materials that otherwise would have gone to trash. He has for example a series of chandeliers made ​​of those metal hangers that we receive from dry clothes. A lamp base of your disks store the creative collection of vinyl that you didn’t want to separate from. Designer Jeff Davis’ creations, from Vinylux, have been already exhibited in several museums. He recycles records and transforms them into bowls, cups or pads watches. Humor is the basic ingredient for designers from Spinning Hat. They have some examples of original, playful products objects that make people smile. They are perfect as gifts. Not wonder they were again nominated in 2011, for the Gift of the Year United Kingdom. The Greatful Thread is a design studio in the UK which is recycling special discs and turn them into clocks with custom design in the shape of a record stylus. Have you given any thought at all with converting your blog into Chinese? I know a several of translaters right here which would certainly help you do it for free if you want to make contact with me. I’ve been exploring for a little for any hiigh quality articles or blog posts on this sort of area . Exploring in Yahoo I ultimately stumbled upon thios site. Studying this info So i am satisfied to express that I’ve a very good uncanny feeling I discovered just what I needed. the idea was so inspiring me !